The concept of high-speed and high-efficiency HVAC systems in Toronto is a relatively new concept in the city. With hundreds of expatriates and short-term residents in Toronto looking for rental or short buy services at affordable rates, the installation package could prove to be a rather costly affair. To understand the installation of the high-velocity HVAC units in Toronto, it is important to connect to the best professionals in the city. Installation of the high velocity HVAC units is no mean task. It is a highly sophisticated assignment that requires elaborate field assessment and budget planning. Depending on the age of the building and the space you wish to cool or heat, the installation procedure too will vary. If you are living in a rented space or in a vacation house, it is obviously a smarter option to go for furnace rental services and air conditioner rental units. High-velocity HVAC systems require elaborate ductwork installation. However it is largely related to flexibility and the use of quality material. The biggest challenge a regular ductwork layout will impose on the new system is the size and the volume of the HVAC unit. High-velocity air flow with proper heating and cooling comes from a small duct which removes the constraint of sticking to the existing architectural structure. High velocity HVAC units distribute high quality airflow using fully insulated tubes and sealed ductwork installation. 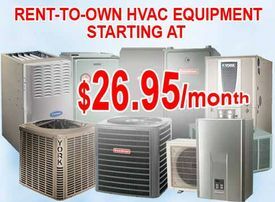 This is why the experts recommend the rental HVAC contractors Toronto services.